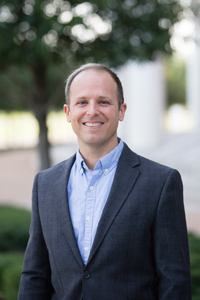 Baylor>Department of Religion>Our Faculty>Faculty>Matthew Whelan, Ph.D.
Matthew is a moral theologian, whose current research agenda lies at the intersection of theology and agroecology, the so-called science of sustainable agriculture. Agroecology integrates ecology into agriculture, and it characteristically looks to local ecosystems as the most appropriate model for agricultural practice, with farmers, in effect, seeking to mimic local ecology. In proceeding in this way, agroecology evokes certain lines of natural law reflection within the Christian theological tradition, in which the created order displays God’s wisdom—even if in a fragmentary and imperfect fashion—and human beings have something to learn from close attention to it. His explores what natural law tradition and agroecology can learn from one another about natural order, the place of humans within it, and the tilling and keeping of the world. Matthew’s articles have appeared in the Journal of Moral Theology, Nova et Vetera, Crosscurrents, Biodiversity and Conservation, and Agriculture, Forestry, and Fisheries. At present, he resides in Waco, Texas, with his wife, Natalie, along with their three daughters, Chora, Edith, and Simone. Artur Mrówczynski-Van Allen, Between the Icon and the Idol: The Human Person and the Modern State in Russian Thought and Literature—Chaadayev, Soloviev, Grossman, trans. Matthew Philipp Whelan (Eugene, OR: Cascade Press, 2013). “You Possess the Land that Belongs to All Salvadorans”: Archbishop Óscar Romero and Ordinary Violence. Modern Theology (October 2019). “The Grammar of Creation: A Theological Engagement with Agroecology.” Communio (forthcoming). “‘Jesus is Our Jubilee’: A Theological Reflection on the Pontifical Council of Justice and Peace’s Toward a Better Distribution of Land: The Challenge of Agrarian Reform.” Journal of Moral Theology (June 2017). Leigh A. Winowiecki, Matthew Philipp Whelan, et al. “Local Soil Knowledge and its Use in Crop Allocation: Implications for Landscape-Scale Agricultural Production and Conservation Efforts in Talamanca, Costa Rica.” Agriculture, Forestry, and Fisheries (2014). “Land, Economy, and the Measure of Christ: The Catholic Agrarianism of Vincent McNabb, O.P.” Nova et Vetera 10:1 (Winter 2012). “Prefiguring the Salvation of the World: The Eucharist and Agriculture.” College Theological Society Annual Volume 55 (2009). Matthew Philipp Whelan, et al., “Medios de vida y dinámica del uso del suelo en los Territorios Indígenas Bribri y Cabécar de Talamanca, Costa Rica.” Agroforestería en las Américas 64 (2008). R.M. Dahlquist, Matthew Philipp Whelan, et al., “Incorporating Livelihoods in Biodiversity Conservation: A Case Study of Cacao Agroforestry Systems in Talamanca, Costa Rica.” Biodiversity and Conservation 16:8 (2007). “The Promise and Perils of Agriculture in Laudato Si’,” in Integral Ecology for a More Sustainable World: Dialogues with Laudato Si’, eds. Matthew Eaton, Dennis Patrick O’Hara, Michael Ross (Lanham, MD: Lexington Books, forthcoming). “The Business of War in Latin America,” in The Business of War: Theological-Ethical Reflections on the Military-Industrial Complex (Eugene, OR: Cascade Books, forthcoming). “The Grammar of Creation: Agriculture in the Thought of Pope Benedict XVI” in Environmental Justice and Climate Change: Assessing Pope Benedict’s Ecological Vision for the Catholic Church in the United States, eds. Jame Schaefer and Tobias Winright (Lanham, MD, Lexington Books, 2013).